The sweet potatoes did need some trimming, but if I cut them the way I planned to cut the carrots, in sticks, to saute – no, not saute. I needed to be sure everything cooked evenly, without fuss. And then, it all came together easily. And was good enough to repeat! I did want some seasoning. My first thought was ginger, which again is wonderful with all the ingredients. 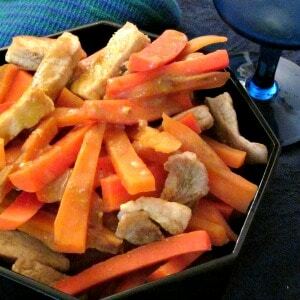 So wonderful that I recently noticed I’ve used ginger in virtually every carrot recipe on the site – maybe a little variety, here? 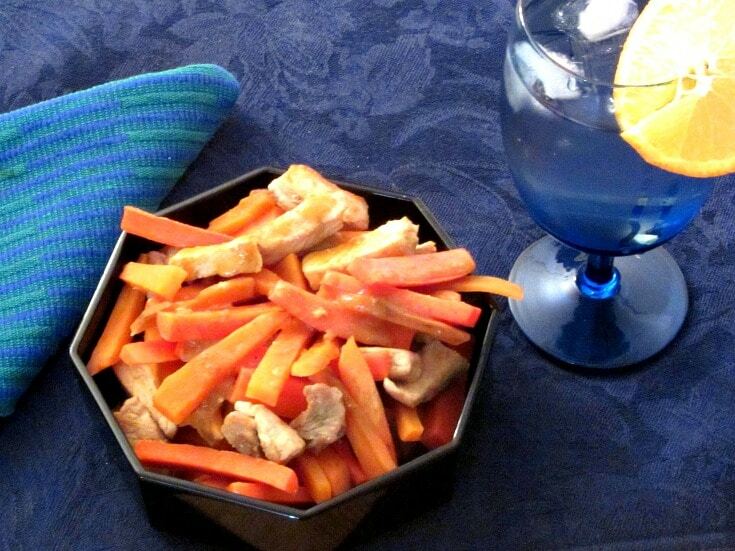 (Ginger is not mandatory with carrots – just good.) What about cumin? First, cut everything up. Peel the sweet potatoes (if you want to) and scrub the carrots, and cut them in – I was going to say matchsticks, but these are about twice that thickness. And sure you can use a mandoline (though I find them more trouble than they are worth for carrots) but a good sharp knife makes short work of them. 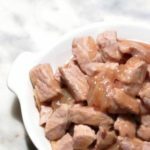 Then cut the pork into similar pieces. Now you’ve done most of the work. 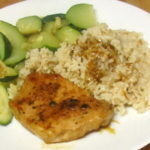 Heat a pan and add a little olive oil, and some ground cumin. Spread the meat out in the hot pan, let it sit and brown a minute or two, then stir it around to cover with the spice, and brown the other sides. After another two or three minutes, add the carrots and sweet potatoes, and stir well. Add a pinch of salt, and orange juice, and again, stir to coat. Bring the juice to a high simmer, and cover – you need to steam the vegetables, but don’t want a full boil which could toughen the meat. 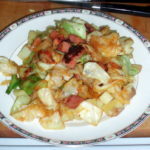 Check after ten minutes, and use a sharp knife to see how tender the vegetables are. (Make sure you check both a carrot and a potato!) If they need it, give them another minutes or two. If not, use a slotted spoon to remove all the solids from the pan. Raise the heat and stir the remaining juice while it boils down a little. It will thicken slightly after a minute or so. Spoon it over the the food, as a sauce, and serve at once. And there you are. Full meal in one pan (though a green salad on the side would be lovely.) 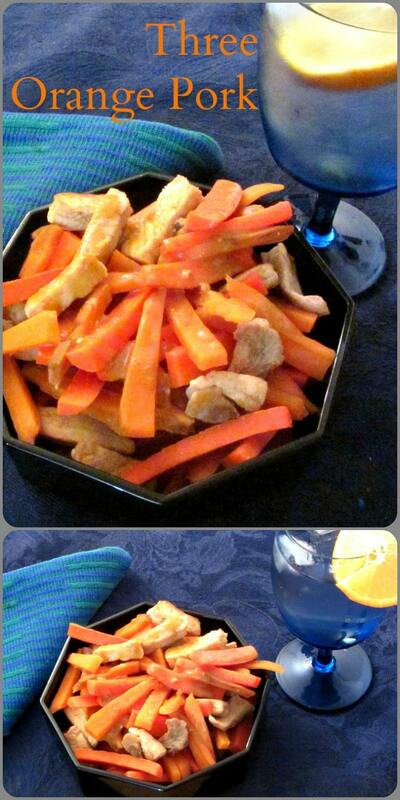 And a fun play on the idea of Orange – with two orange colored vegetables, and orange juice! 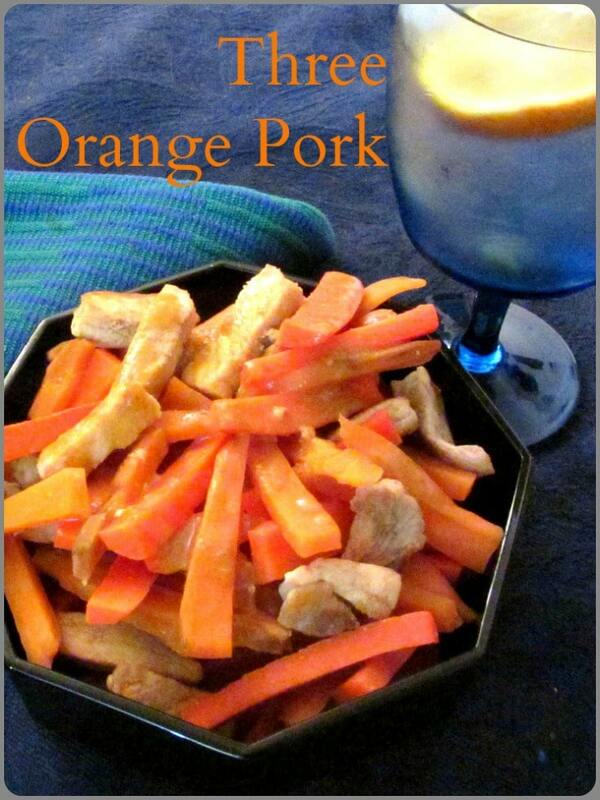 Three Orange Pork - two orange colored vegetables, and a little orange juice come together with tender pork loin in a fast and easy one pot dinner! 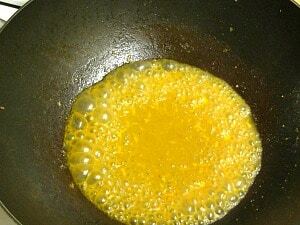 Heat oil in pan, add cumin. 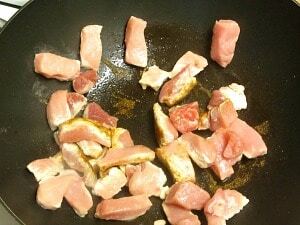 Lay meat out flat in pan to brown for a minute or two, then stir to coat with the cumin. Saute for another minute. Add vegetables, salt and juice, toss to coat. Bring juice to a high simmer, then cover the pan. Check after 10 minutes to see if done. 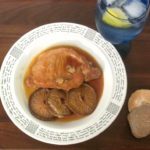 If it is, remove solids to a serving dish with a slotted spoon, then raise the heat and boil the juice down for a minute until it thickens slightly. Then spoon that sauce over the food, and serve at once. Yum. This looks so delicious!! My hubby is going to love this!